Star Micronics Co., Ltd. is proud to announce the new release of an innovative print solution, Star’s “WebPRNT” which supports HTTP request used in web-based applications and enables printing from such applications. Keeping up with the emergence of the omnichannel business model and growing customer demand for mobility, businesses are turning to web-based applications as a cost effective way to stay agile. Web-based services are being more commonplace in point of sale as businesses streamline their operations and create mobile friendly environments for their customers. To support customers using web-based point of sale applications, Star Micronics delivers Star’s WebPRNT, an innovative technology enabling device-agnostic receipt printing technology that supports HTTP requests used in web-based applications. In addition to web-based applications, Star’s WebPRNT also supports HTTP requests from native applications. Star’s WebPRNT eliminates the need to install drivers or download software. 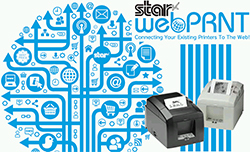 Star’s WebPRNT enables printing from any local device hosting a web-based or native application to Star’s WebPRNT receipt printer. Competitively priced, Star’s WebPRNT enables printing from any application compatible with all operating platforms without the need for expensive multi-platform development costs. Star’s WebPRNT allows users to print from their application to Star’s WebPRNT receipt printer from any device (Mac, PC, tablet, smartphone, etc.) regardless of its operating platform (Windows, iOS, Android, etc. ).